Oyster growers in Virginia’s portion of Chesapeake Bay can now apply for $260,000 in funding through USDA’s Regional Conservation Partnership Program (RCPP) to help restore oyster beds on private shellfish grounds. 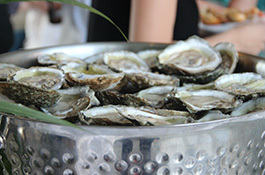 USDA’s Natural Resources Conservation Service (NRCS) is expanding its six-year aquaculture collaboration with the Virginia Marine Resources Commission (VMRC) and the Virginia Institute of Marine Science (VIMS) to support Bay water-quality improvements and create habitat for oysters, fish, and other wildlife. The new partnership project will provide $776,284 in dedicated RCPP funding and resources to restore about 40 acres of privately leased oyster beds. 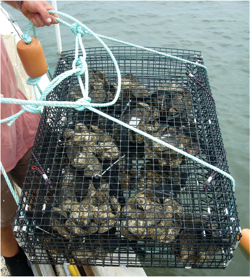 VIMS has extensive experience providing technical assistance to Virginia growers and will partner with VMRC to help oyster farmers locate the best site(s) and shell sources for oyster-bed restoration on their leases. VIMS’ dedicated extension specialist will also facilitate outreach to communities and agency representatives to promote environmentally friendly practices in the state’s shellfish aquaculture industry. Producers who receive services from the Accomac, Chesapeake, Gloucester, Quinton, Smithfield, Tappahannock, and Warsaw NRCS Service Centers may be eligible to participate in this project. Interested individuals must submit a signed VMRC pre-approval form and complete an application with NRCS by November 17, 2017 to be considered for FY18 funding. If all funds are not obligated, the next deadline will be December 15, 2017. “This team approach will enhance the existing NRCS Aquaculture Initiative by providing more dedicated dollars and technical assistance to put growers back into production in areas that have remained fallow for years,” said NRCS State Conservationist Jack Bricker. RCPP matches a federal investment with state and private capital to advance natural resource conservation and support agricultural production. For more information on Virginia RCPP projects, visit www.va.nrcs.usda.gov. To learn more about VMRC projects/activities, visit www.mrc.virginia.gov/Shellfish_Aquaculture.shtm.